For people who feel they need to eat a filling breakfast to prepare for a physically demanding day ahead, rather than turn to sugary cereals, I often suggest making a smoothie bowl. Simply combine equally parts frozen banana chunks and unsweetened plant milk, blend until smooth, and top with anything you like. Almond butter and in-season blueberries are a favourite in our household. If you have a strong blender that doesn't require as much liquid to homogenize frozen banana chunks, you can make what amounts to a dairy-free ice cream. Smoothies made with fresh fruit and nut butter also make for a replenishing post-workout snack. 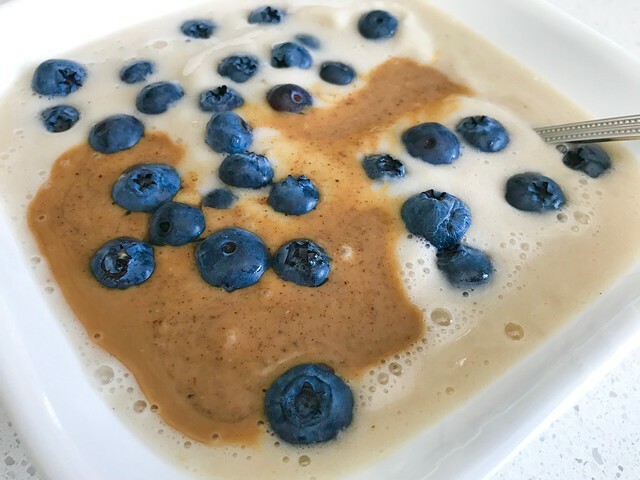 I hope you have a chance to try and enjoy this simple banana, blueberry, and almond butter smoothie bowl.